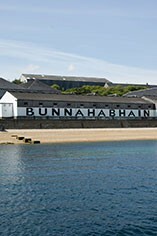 Bunnahabhain translates as “mouth of the river” from the gaelic, the river in question being the Margadale which flows into the Sound of Islay near to the distillery. 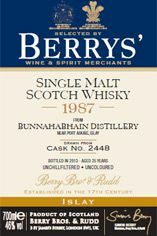 This fine 25 year-old malt gives proof that heavy peatiness is not the be all and end all when it comes to high quality Islay Malt Whisky. The nose is beautifully perfumed with exotic fruits, wood spice and honey. The palate is rich and sinewy with more exotic fruit and a faint drift of smokiness in the background. One perhaps to savour in a darkened room.